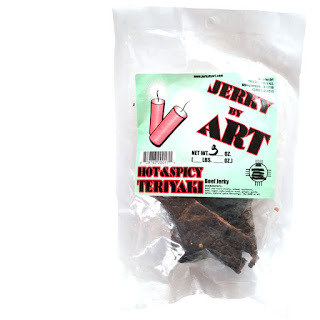 Jerky by Art was established by Arthur Sandoval in 2004, based out of Albuquerque, NM. 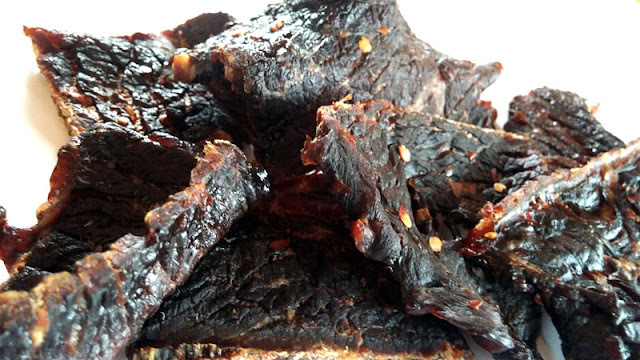 As an iron worker, Art started making carne seca (Mexican-style jerky) at home for his own pleasure. He would take some to work and sell it to co-workers. He was selling so much of it, that he bought more dehydrators. Before he knew it, he was producing jerky all day and night. And thus became, Jerky by Art. This Hot & Spicy Teriyaki variety is marketed as "a sweet taste that just might bite ya back!". The first flavor I pick up is a light sweet that slowly progresses into teriyaki. The chewing brings on a meaty, beefy flavor. For being labeled, "Hot & Spicy Teriyaki" it doesn't quite hold up. It does have the teriyaki flavor, mostly as a sweet and soy sauce, but doesn't seem to be hot or spicy at all. Despite the appearance of red chile pepper flakes on these pieces, the advertised heat and spiciness is absent. The red chile flavor, however, is noticeable in light amounts. Otherwise, the primary taste profile is that of sweet with a light soy sauce, a meaty, steak flavor, and touch of red chile for taste. The meat consistency seems excellent, lightly marbleized with nothing stringy or unchewable. It's dry, with a light crunch, but not tough. It actually breaks apart and chews somewhat easily. 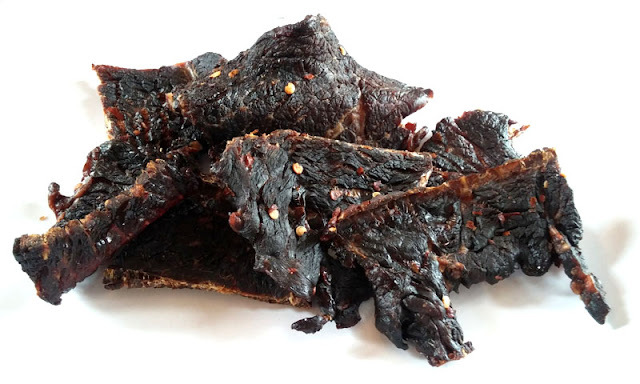 It's very much like other jerky brands from New Mexico, highly dry, lightly crunchy, yet still chews down to a steak-like texture. This Hot & Spicy Teriyaki variety from Jerky by Art creates a noticeably sweet, but light teriyaki flavor touched with some red chile pepper flavor. It's actually quite good considering the natural meat flavors come out well. But you won't find anything "hot & spicy" in this. It's actually quite mild. But otherwise, it's a good jerky for its great meat consistency, steak-like chewing, and natural meat flavors. The light teriyaki seems to let the goodness of beef show through, but delivers enough of its own characteristics to give both a sweet & savory chew.